David Dunn has a new and exciting style of Aboriginal art that encompases all races, creeds and sexuality. It is a unique version of Aboriginal art, he has moved on to more colourful designs but still sticks to the tradition of painting what you Feel not what you see as handed down to him from his parents when he was just a small child. His latest art is called the “Rainbow Dreaming Series” A limited edition of paintings created especially for the Gay & Lesbian community. To view some of his most recent works just click here or visit the website or click on one of the photographs of his paintings below. Hey all, our Aboriginal Art Show held the last weekend in November was a huge success with over 50 paintings sold and a wide range of visitors (some international) who came along to appreciate what David Dunn has achieved. World history was in the making with David’s unique style of painting along with the amalgamation of Aboriginal and Gay & Lesbian themes in his new works. Everyone is invited to our showing of Aboriginal art by David Dunn, over 80 original paintings to view and or purchase. All works are priced reasonably. Also there will be a special showing of our new Indian Statues measuring up to 2 metres in height. To be Held at our shop at 12 High St, Yackandandah. Victoria. 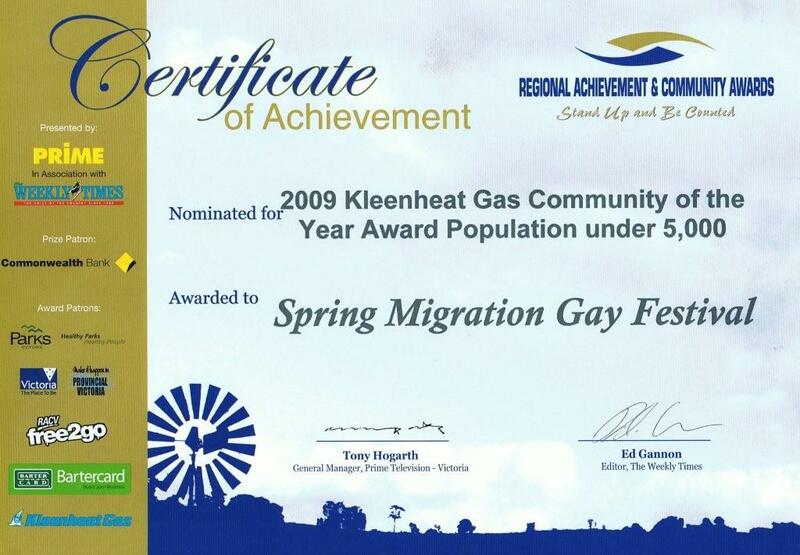 Australia from Friday 27th November and Sunday 29th November, 2009 between 9.30am and 6.00pm daily. .
Spring Migration 2009 Receives Award – Certificate of Achievement – Regional Achievement & Community Awards It was a fantastic event (nine days) . Order your tickets now for La Luna Full Moon Dance Party VENUE: La Trobe at Beechworth phone (02) 6027 1114 or click here to get your tickets online. Reserve them now and we can hold them at the door for you. Victoria’s gorgeous North East is getting ready to frock up and hit the dance floor with the return this weekend of one of regional Australia’s favourite Gay & Lesbian events, Spring Migration. Now in its fifth year, the 2009 festival has grown from a weekend event in Yackandandah to a week-long celebration taking place around the region. Spring Migration 2009 kicks off this Friday 28 August with three days of fun at Falls Creek including a masquerade ball and snow carnival. From Tuesday 1 to Thursday 3 September, the party continues at Lake Hume Resort with a packed program of activities, tours and parties. Then on Friday 4 and Saturday 5 September Indigo Shire welcomes Spring Migration to Beechworth. The Saturday night La Luna full moon dance party at La Trobe promises to be a highlight of this year’s event with glamorous Sydney entertainer, Vanessa Wagner, as special guest emcee. DJs, drag shows, special guest performers and dancers, food and full bar will also feature at this sensational closing night festival party. The annual Who’s Yer Daddy Father’s Day Market in Yackandandah on Sunday 6 September will bring Spring Migration 2009 to a close. Now one of regional Australia’s most popular Gay & Lesbian events, Spring Migration prides itself on its inclusiveness, offering everyone, regardless of their sexuality, a varied and fun program that also showcases this area’s regional delights.